From the 1st January - 31st March 2018 you will receive an additional 3-year warranty when purchasing a Siemens studioLine oven with four other qualifying Siemens appliances, as part of an overall kitchen purchase. 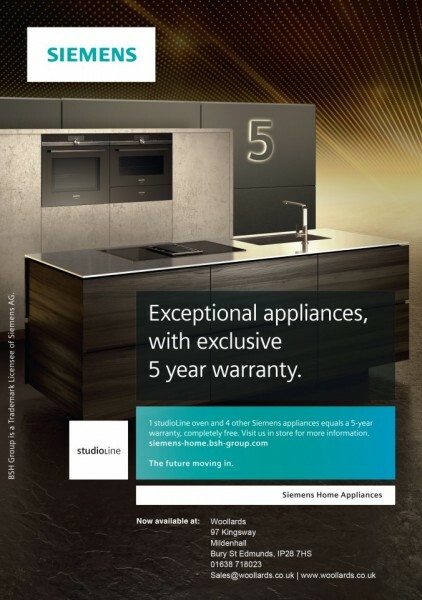 Visit our showroom for a hands-on experience with the exceptional studioLine range from Siemens. At Woollards, to ensure the very best experience, our appliances are all powered so that you can enjoy the excitement that Siemens appliances provide, the Woollards team would be happy to answer any and all questions you may have. We are pleased to announce the that the list of models that qualify for the Siemens 5-Year Warranty promotion has been increased. You can now choose any 4 Siemens built-in appliances (excluding accessories and selected hobs) to complement their studioLine oven. For a comprehensive list of whats available, call in today for a friendly conversation or email our team for a thorough and concise answer. The ultimate in design, innovation and intelligent features. The Siemens studioLine range takes kitchen design to a new level. With clean lines, intuitive controls, and state-of-the-art technology; studioLine provides an experience like no other. It is the elite choice for those who appreciate the finer things in life and value having the very best. Designed to seamlessly complement any kitchen, the studioLine range is unique in its styling. Black stainless steel handles, black stainless steel disc control, and bigger, brighter TFT touchDisplays combine to create the ultimate in elegance. Equally as impressive is the intelligent technology and innovation. The oven’s all-new sous-vide setting and vacuum drawer allows food to be cooked with the exquisite flavours and delicate textures once reserved for professional chefs. Then there is the cooking freedom of using freeInduction, an innovative full surface hob that provides the unparalleled flexibility of heating cookware of any size and shape in any position. With all appliances built-in, they can be combined in any combination to fit your lifestyle perfectly. The studioLine ovens, compact ovens, coffee centre and warming drawer all lineup thanks to coordinated front panels. The new Siemens studioLine range redefines what is possible both in design and technology. It takes cooking to perfection. This entry was posted in News and tagged Appliances, Kitchens Cambridge, Siemens, Studioline, Woollards of Mildenhall. Bookmark the permalink. Woollards support local youth group, Mildenhall Scout Group! Massive Ex-Display Red Dot Sale Event!